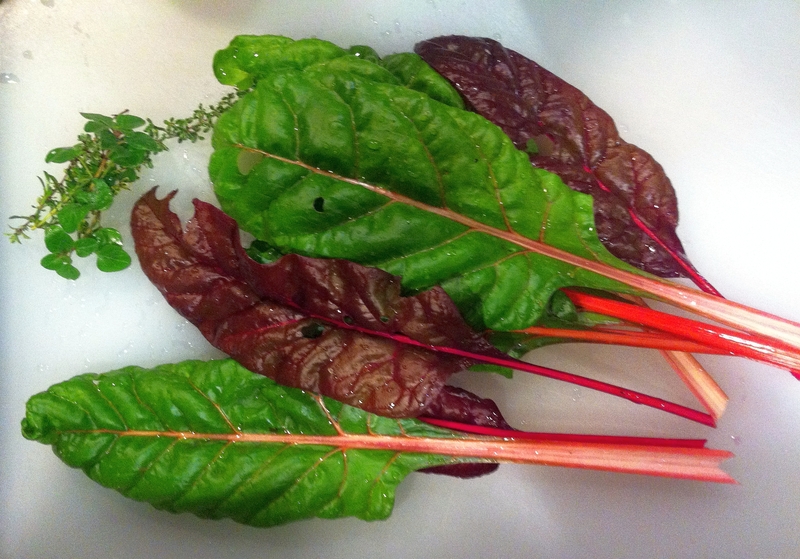 One of our favorite greens is Swiss chard. It is versatile and tasty. We’ve use it in soup, stews, pasta, salads and as a side dish. The small plants we put in the ground back in early May are really digging the cool nights and are flourishing as we reach the end of October. We picked some after work tonight, as dusk was descending, along with some thyme, oregano, and winter savory. We used those in an old favorite, Orecchiette with Chickpeas. I have a version closer to what we made tonight which doesn’t require the overnight soak of dried chickpeas nor the handcrafting of pasta. You can find it over here. Another advantage, it is a one pot meal. And tasty if I do say so myself. I discovered this braised cabbage recipe in a magazine at the eye doctor’s office. We happened to have a head of cabbage at the time so it seemed worth a try. It worked out rather nicely. Heat the olive oil over medium heat in a pot large enough to hold all the cabbage. Add the shallot and stir to coat. Cook for 1-2 minutes, until the shallot begins to soften. Add the mustard and vinegar to the pot. Stir to incorporate the mustard, vinegar and shallot. Add the cabbage to the pot. Toss the cabbage with the mustard, vinegard and shallot. Cover the pot and cook for 10-15 minutes, tossing the cabbage every few minutes. Another week, another Saturday night. I had intended to roast a boneless pork loin this week. I miscommunicated what I wanted to the clerk at the grocery store and ended up with a butchered just-for-me bone-in pork rib roast. When life hands you rib roast you make rib roast. When vegetarians are away we often make meat-integrated meals. Others might call them casseroles. We made a casserole of sorts, a very tasty sort of casserole. There are probably as many versions of shepherd’s pie as their are colors in the rainbow. In fact you’ll find a variation I made back in 2010 here. As we try to eat a bit healthier I added a few more veggies, cut back on the fat (a bit) and switched to non-red meat. It was still tasty. One of the challenges of this recipe is bringing the various components (veggies, meat and mashed potatoes) together at the same time. I’ve tried to show how I do that in the recipe below. About an hour before you want to start cooking pull the frozen corn from the freezer and leave it on the counter to thaw (or do it in the fridge overnight). Preheat oven to 350°F. Grab a 13″x9″ glass baking dish and place it near the cooktop. Prep the potatoes, peeling all of them, then rinsing them. Cut into 1″ dice and rinse again. Then fill the pot with water so there is about 1″ of water above the potatoes. Put the pot on the stove, add a big pinch of kosher salt and cover. Heat over high heat; once it starts boiling cook for 8-10 minutes. You want fork tender potatoes, not mush. Prep the remaining veggies. You can combine the leeks and peppers in one bowl. The garlic should go in a small bowl by itself, you’ll use it with the pork. Heat 1 tablespoon of olive oil in a large skillet over medium heat until it shimmers. Add the leeks and peppers. Add a pinch of salt and a few grinds of pepper. Toss to coat with oil and cook for approx. 5 minutes until tender. Add the thawed roasted corn to the skillet and mix with the leeks and peppers. Add 2 tablespoons of unsalted butter, cut into pieces, to the skillet and toss until melted. Once the corn is heated through taste for flavor, add salt & pepper if necessary and spread the contents of the skillet evenly in the bottom of the 13″x9″ baking dish. Add 1/2 tablespoon of olive oil to the skillet and heat until shimmering. Add the ground turkey, breaking up into 1-2″ cubes. Cook for 5-10 minutes, breaking up into smaller pieces, until the turkey is cooked through. Drain any liquid that accumulates. Add the Worcestershire sauce and toss with the turkey to evenly coat. Add to the 13″x9″ baking dish and spread on top of the veggies. Add the remaining olive oil to the skillet and heat. Add the ground pork and use the same steps used with the turkey (break it up, cook, make smaller pieces). When cooked through add the garlic and paprika. Stir to incorporate and cook until the garlic becomes fragrant, 30 seconds to 1 minute. Add to the 13″x9″ baking dish and spread evenly. If you timed things properly the potatoes should be fork tender right about now. Drain thoroughly and return to the hot pan. Toss a couple of times to help dry off the potatoes and then mash them to a rough consistency. Heat the milk in the microwave for 1 minute on high and then add it to the potatoes. Add 4 tablespoons of butter and the sour cream as well. Stir the potatoes until they become fairly smooth. Taste for salt and adjust seasoning as needed. I usually add black pepper at this point as well. Spread the mashed potatoes over the veggies and meat in the 13″x9″ baking dish. Avoid the temptation to make the top smooth, you want some swirls and crags. Dot the top of the potatoes with pieces of the remaining butter. Bake for 40 minutes at 350°F. Raise the oven temp to 425°F and cook an additional 5 minutes to help brown the top. In general you’ll enjoy this better if you let it sit for 10-15 minutes before serving. Have a glass of wine, talk with your friends or family, wash a few dishes if you must. As I said above timing the cooking so the potatoes are ready for mashing when you’ve finished the cooking of veggies and meat isn’t easy. If the potatoes are ready early then pause in the veggie, turkey and pork cooking to mash the potatoes. They can sit in the pot with the lid on for 15-20 minutes if needed.